Let's look at the market's performance on 4th April, 2019. The top sale of the day was CubeChain.com which sold for $7,105 at GoDaddy. NameBiorecorded 328 sales $100+ for a total of $143,003 with an average sale price of $436. Compared to the previous day there was a decrease of 5% in the number of sales and the total dollar amount decreased by 33%. We also recorded an additional 1,568 sales below $100 for a total of $38,681. The domain AITD.com sold for $1,862 at DropCatch for a decrease of 54%. It last sold for $4,088 on October 23rd, 2007 at Afternic. 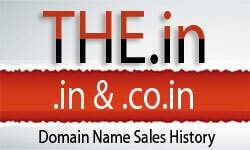 The domain P41.com sold for $1,100 at NameJet for a decrease of 65%. It last sold for $3,100 on June 15th, 2017 at NameJet. The domain UniClear.com sold for $449 at GoDaddy for a decrease of 78%. It last sold for $2,000 on July 3rd, 2013 at Sedo. The domain UltimateDining.com sold for $130 at GoDaddy for a decrease of 91%. It last sold for $1,400 on December 2nd, 2015 at BuyDomains. The domain Munee.com sold for $328 at DropCatch for a decrease of 97%. It last sold for $10,000 on August 31st, 2017 at Uniregistry.